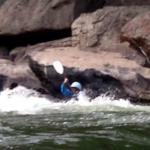 Darron P. and myself joined Will, Mike and Scott at Watagua Gorge on Saturday April 25th. 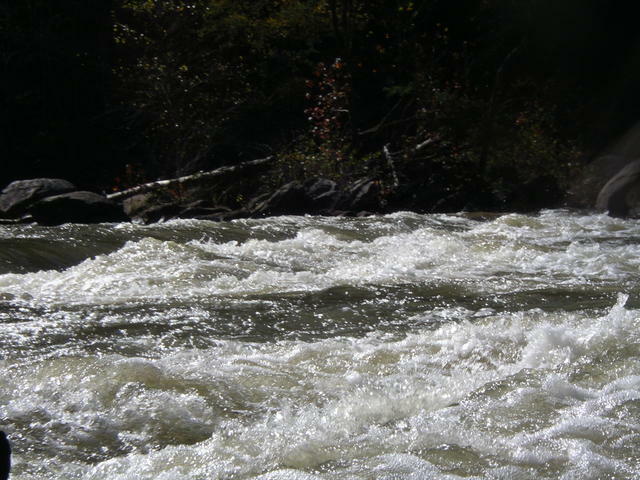 It was a nice late April day, with gauge level around 145 cfs, so it was a low water run, but the best show around. Sugar Grove gauge upstream was reading in the 145 cfs range, but skies where sunny and we had temps into the 70’s so it was a great late April day for paddling Watagua Gorge. The top was a bit bony but doable, just some places you had to alter your line a bit or throw a boof in to fit where the flow was channeling. Enough was adding in from feeder streams that a little further down flow was better. At the first big ledge/boulder pile, Bump & Grind we negotiated a entrance that was a tight drop with a tight right turn down a slot to the next level below and then hammer back left to boof through and over and back down a series of drop on far left and out to the pool below. Everyone got through pretty good except on the middle coming back left it was bit thin and several of us had to push hard to clear through toward the drops on river left. The entrance on this one was not a line I had used before and as I dropped into the tiny eddy to make the tight right turn I got hung in the hole at the base of the initial drop. After side surfing I decided to step out and set up on a flat rock beside the slot and slide off. Once back in the saddle I dropped off the rock into the chute and work back left and joined the others below. At the next big ledge/boulder pile, S***t-kicker we did a similar line. This one I seem like I had always entered just left of center and booked hard left to avoid the right/center slot that should always be avoid as it leads in to a truly nasty sieve. Mike however was out front and lead the line center going right down to the next platform then hammering back left across some vexatious low rock under the water. Darron followed and had to push and dig a bit to get over the rock on the platform going back left, followed by Scott who also had to work that platform to. I dropped down last and made the turn and as with Darron and Scott and to do some serious digging to work over the ledges going back left, and after clearing these hammer down to drop to join the group. A bit further down we dropped down through a series of ledges, working river left with a boof off the top up next to a boulder. I angled off left as I boofed and caught the eddy below behind the boulder and then could setup for a nice line stair stepping down the next two drops and out the bottom. While in the eddy, I saw Will hole dancing below and ran my line out the bottom to help Mike reunite Will with his boat at a rock just below on river left. Seems he had eddied out to the left of the bottom drop into a whirlpool and got feeded back into the hole below the last drop, one of those narrow, deep, sticky ones. An unusual occurrence for Will, he was quickly reunited and back in the boat. Darron and Scott worked down both boofing straight off and then negotiating the turn down the last two. From there we worked the ledges, chutes and drops down to Hydro. At Hydro we got out and took a look, particularly as this was Scott’s first time. Mike set safety with a rope and then Darron and myself dropped the left slot behind the upper rock into the eddy down in the upper third of Hydro. Darron led off driving for the line to river right and cleared the bottom ledge nicely on the far right. I decided at this low level to drop down through the eddies along river left and then hammer for the left eddy at the bottom and try to either hop the ledge or if possible slide through the eddy behind the rock above the drop river center and then go far right. Well the line did well till just above the river center rock and there the current pushed off the left wall and into a small rock just left of the center rock, hopped the rock, then decided drive hard to the left and boof/hopped the ledge on that side which worked, only below I had drive hard to clear the back-flow on river left clear to the right. Scott made his run next and cleared river right, followed by Mike. Coming up on Knuckles we caught an eddy, just upstream to its entrance, on the right. Due to a recent incident at this one we made sure to give it the respect it is due. This day there was a pretty wonky diagonal just before the entrance where it necks down between boulders just above the drop occurs. This diagonal wanted to turn each of us sideways and bow left, so we all had to crank it up coming out hammering extra hard to straighten up and then push left beside and then behind the boulder on that side. Making sure to hit the drop running hot, left, headed left, and doing a good solid boof off the lip. We all had excellent lines and boofs. A little further down, just above a rapid below here we saw the remains of the boat from a pin incident at knucles from a couple of weeks earlier, it was ugly. 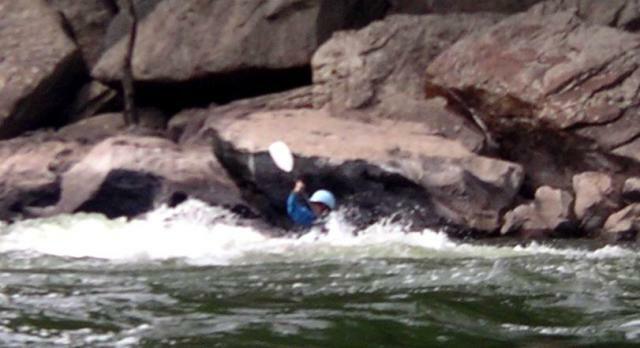 A paddler had come off on the right side and dropped off into a pin, my understanding is that she suffered significant injury and was pinned in the cascade for some time before being pulled out. The boat had significant damage, basically destroyed. It got my attention, take a look at it if you paddle by, it will get your attention too. At Diana’s ledge we all took the diagonal chute off the left end of the ledge. The far right was way to exposed rock wise to run. 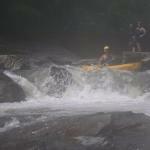 Well we worked long string of rapids and moves down to the last real pool upstream the run down to Stateline Falls. Darron, Scott, and myself all got out and went for a scout concerned with the level. After getting out on the cliff on river left below Stateline, I quickly decided I was going to walk it this day. Flow was low enough that most of the tongue was heading left and splatting on the now well exposed end of the rock ledge below. Normally there is a significant amount of the tongue flowing right, but not today. I decided it was not worth the risk trying get far enough right coming off and there was just to much exposed boulder, Darron and Scott looked it over and decided to walk it also. Mike made his drop while we where scouting, and managed to land pretty flat off his boof and far enough right, which was a really good thing as there was not much room for error and little aeration to pad the landing since probably 80% of the water was dropping left and splatting off the boulder. On down stream the ledges at the abandon gauge tower where pretty thin, and even at better flows after entering left and moving back right of center the run can be scrappy, today it was for sure with the drop off the end pretty much a bang down. Watagua Slide had plenty of flow for us, and we worked down the remainder of the gorge rapids through Last Hair, where Darron and Mike went for it jumping straight into the opening left of center and hammering up to the ledge and down right to the corner and out on river right. Scott and I both dropped through the opening going left into the eddy at the left bank and then work back right to the ledge. At this level it was a bit troublesome getting around the rock just below the surface coming out of the left top eddy, which Darron and Scott probably avoided with their line. At Rewind, the last significant ledge of about 5′, I lead off and took the line just to the left of the boulder/rock outcropping river center which puts you coming off on the right side of the main ledge. 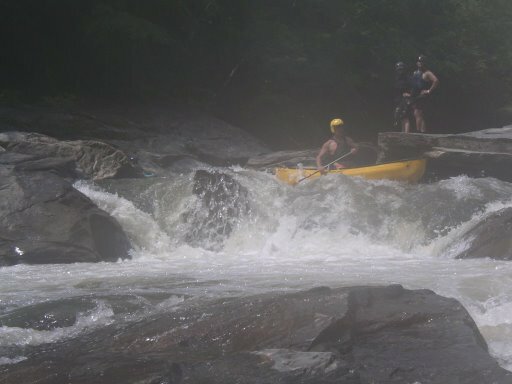 Boofing, I found that I was dropping onto pretty much a rock slide below with a couple of inches of flow. I had tried for a good boof and fortunately landed fairly flat and braced left, so I slid down and out through the flow nicely on my brace, with little or no bang down. Darron and Mike followed the same line nicely, Scott went for the far left side which normally would be into the hydraulic but the water was low enough this day no to be an issue, however the rock in the flow below was and gave Scott a bang down, but he paddled out fine. At the island we turned left and worked, boofed, and scrapped our way down to the take-out, as water here is usually a bit thin at most levels. Fortunately its not far. 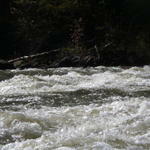 While the flow was low, it was adequate for a nice run and a great day on the river. Beautiful day, fabulous gorge, crystal clear water, outstanding rapids, good friends, all and all what make a great day on the river.